Mobile app is a great help if you are constantly away from your office but need assist your customers through live chat. You can easily chat while waiting for customers or showing property. It will make the communication process fast and convenient. As a real estate agent you can show your customers property even through live chat by sending links or property catalogues. Additionally, you will see your website visitors and navigation of the visitors you are chatting with. Convenient filtering options will show separately chat rooms with answered chats and those where the chat request and chat message are waiting for you. Sometimes it seems that the mission to stay always online and let every single customer connect with you is impossible. However, iOS app will let you do this and stay always available as for small retailers each interaction matters. Convenient sound and push notifications will alert you about an incoming chat request. You will easily accept the chat even if you are not in your office at the computer. Additionally, you will be able to see the content of the shopping cart as well as the pages your website visitor visited while browsing your website. This in turn will help to understand what they are looking for and make the offer they cannot resist. If you are often away from your computer but still need to monitor chat activity, you can take an iOS app with you and launch the operator console on it. It will show website monitoring results and the number of chats of other live chat agents. Moreover, visitors in chat with you and other agents will be highlighted with different colors. This way you can monitor the chat load in your office or monitor other agents by logging into the app with their credentials. 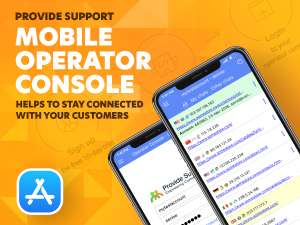 Live chat operator console for iOS is a great solution for small businesses and people who travel a lot and want to stay connected with customers. Try it for your live chat workflow! This entry was posted in Articles, Instructions, News, Tips and Tricks, Tutorials and tagged iOS live chat app, live chat operator console for iOS, mobile app. Bookmark the permalink.